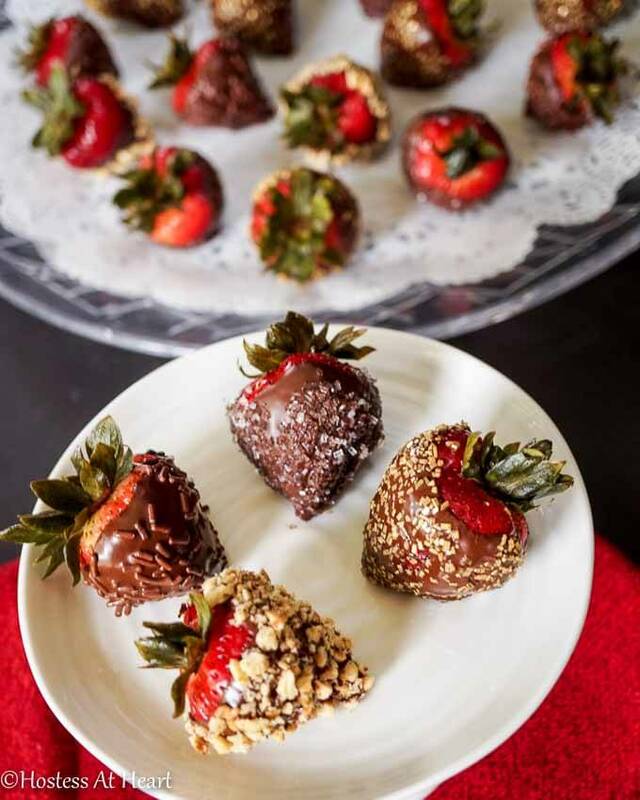 Chocolate Vodka Infused Strawberries is an appetizer that will get the party started. They are just as pretty to look at as they are delicious to eat! We have a wonderful friend that just had a birthday, and his wife was thoughtful enough to get a few of us together as a birthday surprise. 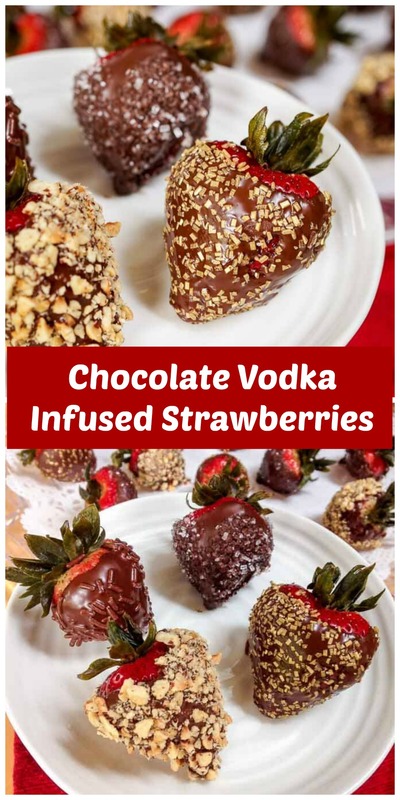 I knew Chocolate Vodka Infused Strawberries would be a welcome surprise too. You have to know this guy. When he is present, you know it. He isn’t afraid to bring attention to himself. Actually, that is his mission, and he’ll even admit it. That may not sound like a redeeming quality, but it’s not like that. He is so funny, and things happen when he’s around. He is also one of those guys that would be one of the first to help a friend in need. We didn’t have to bring anything, but I never like showing up empty-handed. I like to feed people! I knew I wanted to bring something that would fit in with the party theme…booze of course! I’ve been buying these amazing strawberries and thought about dipping them and using some fancy smancy sprinkles. Then my mind went into it’s ADHD drive thinking about the possibilities. We have infused lots of different kinds of fruit, why not strawberries? I was looking in our liquor cabinet (is it bad that I need a whole cabinet just for booze? We will worry about that later) looking for the vodka. Then I came across a bottle of 360 Double Chocolate vodka and, as they say, “the rest is history”. This isn’t a paid endorsement for any product. It’s what I use. Feel free to use your favorite brands. I washed 24 large strawberries and put them in a large jar and covered them with one 750 ml bottle of the double chocolate vodka, which was enough to almost totally submerge the berries. I put a lid on the jar and refrigerated the berries for about 15 hours. You could marinate them for an hour or up to 24 hours. I removed the berries and put them on a paper town and dabbed them dry. While they dried, I melted one bag of Bittersweet chocolate chips in a double boiler. Add sugar sprinkles, ground hazelnuts, and chocolate jimmies to separate bowls. You could use shredded coconut, graham crackers or whatever you like. I also used one bowl to hold the chocolate dipped berries over while I spooned the toppings onto the berries. When I tried just rolling a few right in the bowls of sprinkles, the wet chocolate dripped into the bowls so the sprinkles couldn’t be used. Spooning worked a lot better. Plus I liked the lightly sprinkled look. These berries went over just as well as I thought they were, and I came home with an empty plate. They’re perfect any time of year and just look a little fancier than they are. 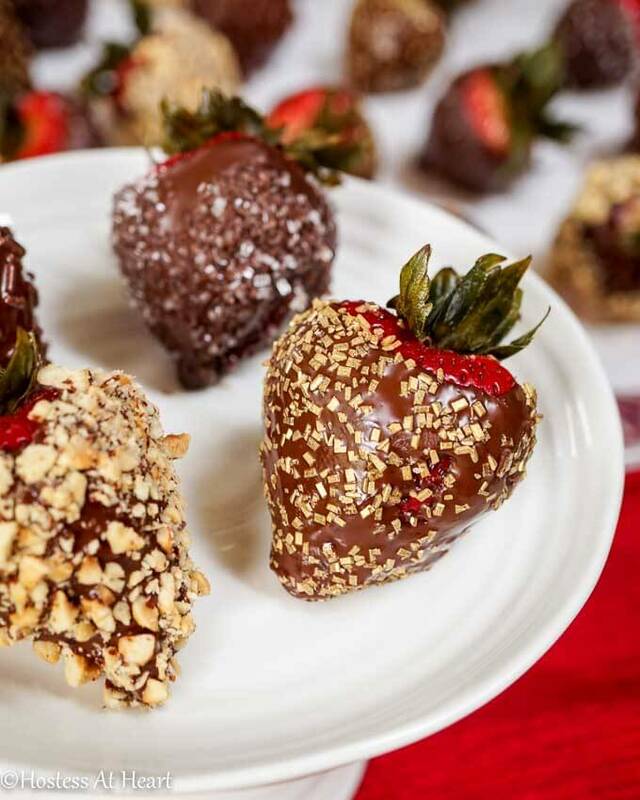 Chocolate Vodka Infused Strawberries is an appetizer that will get the party started. They are just as pretty to look at as they are delicious to eat. Place clean berries into a jar and cover with vodka. Refrigerate for up to 24 hours. Remove strawberries from the jar and pat dry. Melt chocolate chips in a double boiler or microwave until smooth. 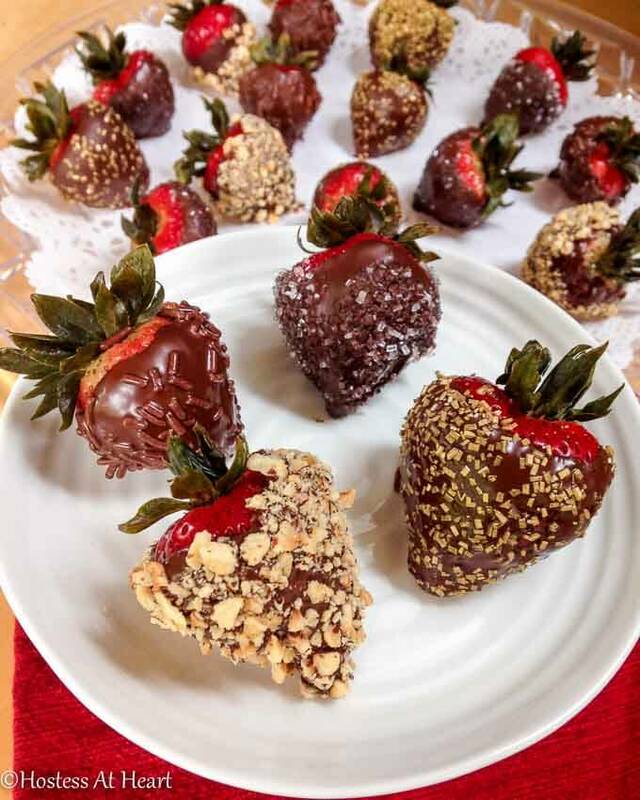 Assemble by dipping berries in chocolate holding onto the stem. Sprinkle with the coating. Place on wax paper and allow to set. Cover lightly with plastic wrap and refrigerate until serving. Prep time doesn't include 24-hour infusing time. You could definitely taste the vodka, but it just enhanced the berries. It didn’t take over. Use good vodka. If it isn’t something you would drink, you sure don’t want to eat it. I poured the vodka back into the bottle and refrigerated it and think I can get one more batch of these Chocolate Vodka Infused Strawberries! If you need a few more ideas for the party, here are a few that we love! Thank you Sonal. 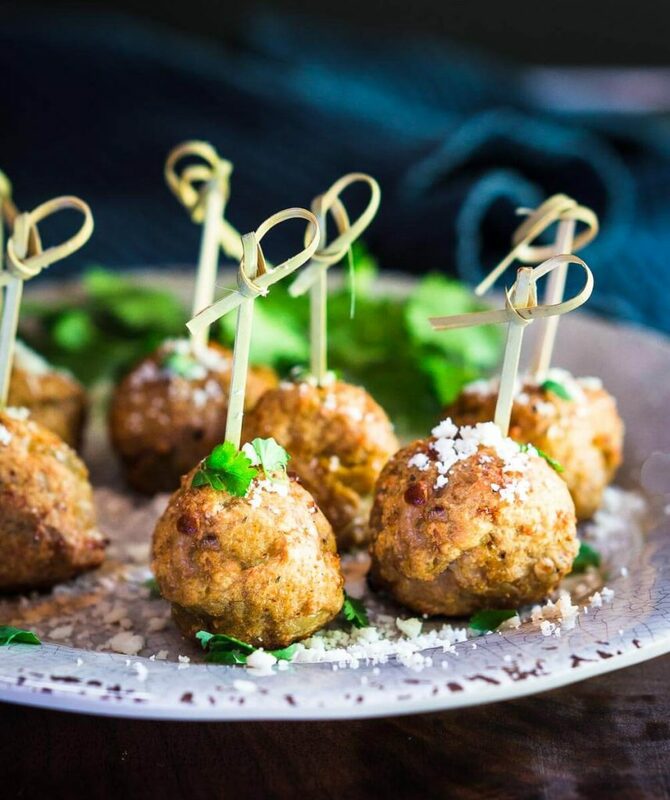 There are just so many ways to make these and are great foe appetizers or a meal. Thank you Sonal! 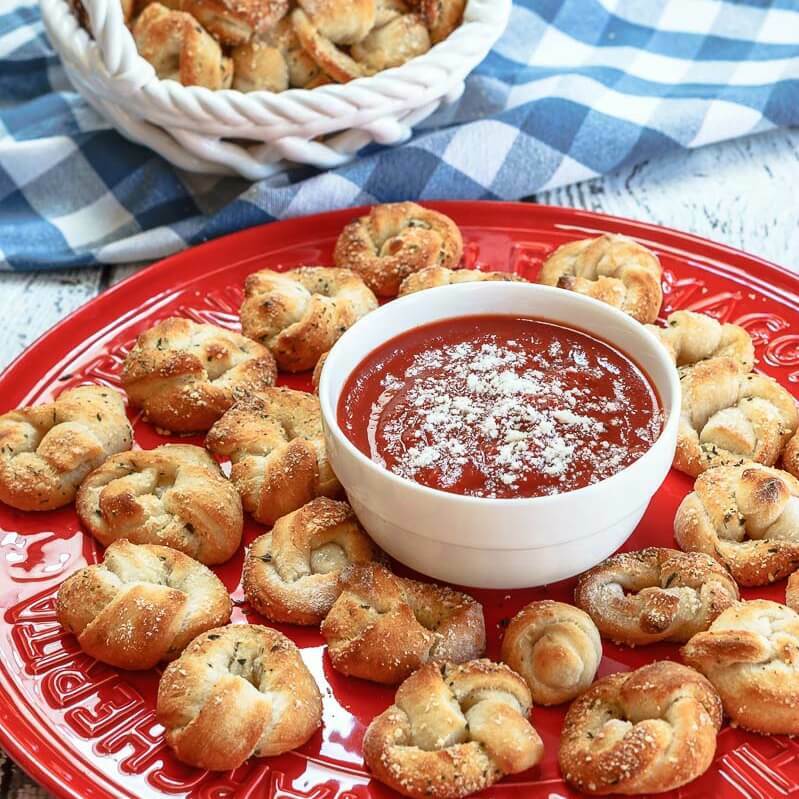 They are great for entertaining on those warm days. Hi, Julie. Did you change something in your blog?! I was very busy and I have missed so much from you and my other blogging buddies. I went self-host? Please let me know if you have any problems getting my posts. I would definitely save a couple strawberries with plenty of chocolate for you! Thank you Dina! I am sure you will make a beautiful batch! I love this idea sooooo much, I need to try it!! Boozy fruit is my kind of fruit! I bet the chocolate vodka tastes even more amazing now after have a bit of strawberry flavour added to it! Sharing these for sure! I am sure you love this version Michelle! Perfect for entertaining. It’s not often you see a recipe that calls for a whole bottle of vodka! The strawberries came out so pretty and sound like the perfect party food 😀 What an interesting technique and something I’ve never considered before! I’m curious now… is the vodka still drinkable after, and does it taste a bit of strawberries? Go big or go home right? I bottled the vodka back up and refrigerated it. I will use it to make another batch. I am sure you could drink it, but I think it would have to be ran through a cheese cloth to rid it of the seeds. Thank you Judi! Very easy and they stood up well through out the night. You must have posted this over the weekend Julie….wow! I missed it, it deserves huge accolades. I can’t get over infusing them in vodka, what a brilliant idea! That party surely had to end on a “high” note, and no thanks to the guy who usually gets everyone “in the mood” :). A great party with a boozy end! Your pictures by the way are just gorgeous, it looks so real, almost like I could reach out and grab one. I like the idea of spooning the sprinkles over too as opposed to dipping them. Thank you Loretta! They really got a lot of attention. People really thought that they were a big deal but they were so easy. The booze wasn’t overbearing at all but you could taste it. Thank you for the compliments on the pictures! You know how that is, when you get one you like it’s like hurray can I do it again? 🙂 I did roll these in the nuts, but you really can’t in the sugar. They will turn into sugar blobs, not very pretty at all. Thank you Debbie! I love them and they just say summer to me. I had no idea that they made chocolate vodka? Wow I love this recipe for the holidays and it would make a great gift to a special someone! Thank you Bobby! You are right, they would made great holiday appetizers or gifts. My friends thought that these strawberries were a much bigger deal than what they really were. I love chocolate coated fruits and this one looks gorgeous…. yummm yummm…. Thank you Chitra! I just love the strawberries right now! This is brilliant Julie! Loved the idea of infusing it with liquor! Thank you Sonal! Everyone enjoyed them. What a perfect idea! I usually look at the strawberries at the market and imagine dipping them in chocolate, but this is a notch up! Can’t wait to try. Have a great day, Julie! Thank you so much Dave! They really went over and held up well all evening. Thank you! They did go over well Dawn and were a fun spin because it was unique. So pretty and very thoughtful! If they were too vodka strong I wouldn’t like them, but the way you described them they sound perfect!!! Thank you! I agree with you. I think that is the reason to use good vodka. The cheap stuff is bitter and transfers that sharpness to the fruit. Ick! 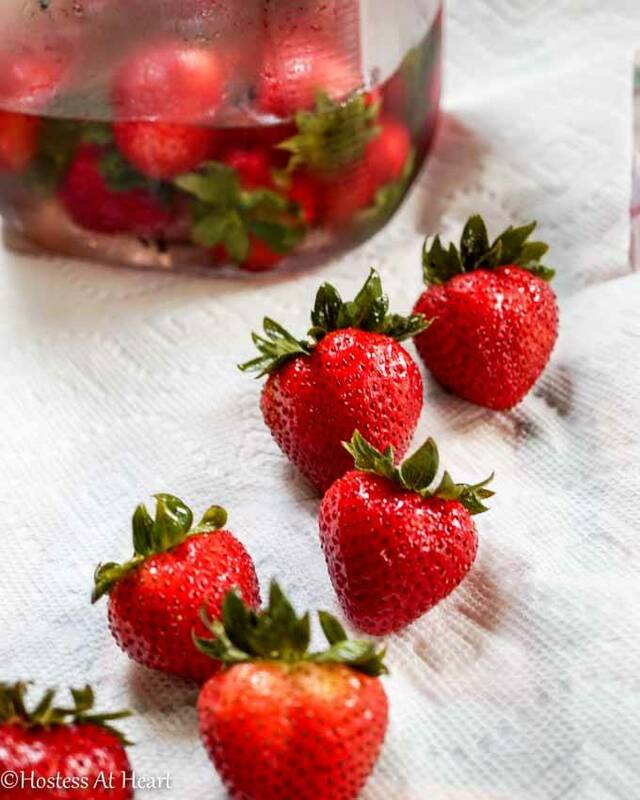 I’ve never heard before about vodka marinated strawberries, but the idea is simply brilliant! I will definitely try these this weekend. Thank you Ana! I hope they go over well for you. You will have to let me know. wow, so beautiful presented, Julie! A great revisited classic dessert! Thank you so much for your super kind comment! interesting would have thought the vodka would make the berries soggy and unusable for covering in chocolate – live and learn eh? Thank you for commenting! They weren’t at all. I think you really need to make sure that they are dry before dipping, but the held up so well all evening. I was worried because it was very humid the day that I made them, but it wasn’t a problem. interesting and good to know -no maceration going on at all then, fascinating! sounds like a resounding success! Thank you! I had to warn people that they had been infused because you sure couldn’t tell by looking at them. Julie those dipped strawberries are just beautiful and love the boozy soak. Great dessert! Thank you! 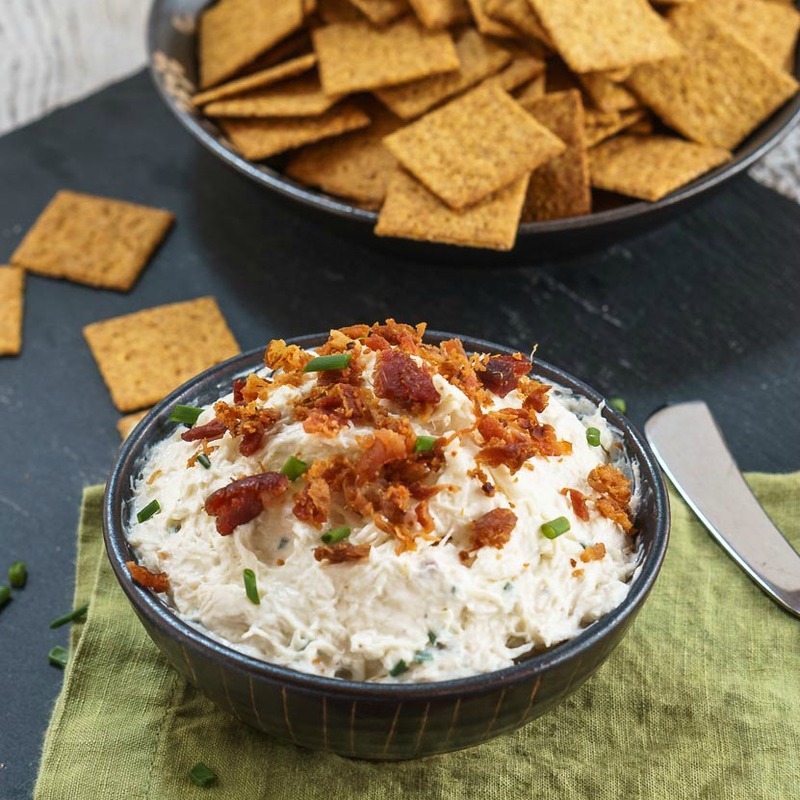 They are perfect for an after dinner dessert or an appetizer. I’ll definitely be making them again. This is the most excited I’ve ever been about chocolate-covered strawberries, which I rather like. Just brilliant! Thank you! They were as popular with the guys as with the girls, and they really held up all evening. I’ll definitely be making them again. These are beautiful, Julie, and I’m sure must taste incredible! What a very creative idea. I bet your friends were so excited to try them. I know I would be! Thank you for stopping by. The strawberries have been wonderful this year and these held up all night. Julie! You party animal! Naughty and fun!!! !